I don’t know about you, but I had wanted to go to England ever since I was a little kid listening to the song about London Bridge falling down. So when I finally got a chance to see London during a long flight layover a few year ago, it was a dream come true. I have since had the chance to explore more of England, and have found it to be even more enchanting. 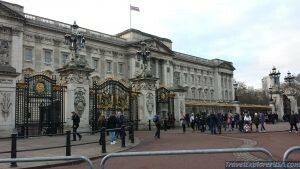 One great way to see many sites in London in a short time is to hire a private taxi tour. For instance, we just wanted to see as much of London as possible during a 10-hour layover on our way to Asia, so we hired a special tour cab. We were fortunate to find a real expert cab driver who showed our party of 5 nearly everything that I had always wanted to see in London in about 4 hours. It was amazing! Of course, I will still need to go back for a proper visit, but it was a real dream come true, and very reasonably priced. Our tour guide asked us what all we wanted to see, and he was able to advise what there would be time for while still getting us back to the airport for our next flight. We happened to be traveling in December, so he even made a point to take us through streets with the best Christmas decorations. It was invaluable to have a local expert as our personal tour guide. We also felt safe having our kids with us in a cab. If you are not able to walk very far, this is also a great option, because the driver can take you right up to the sites. If you have a little more time, or feel more adventurous, you can take the tube (underground train) from the airport and use that system and buses to go all over London. They have wonderful public transportation, and it is affordable. It’s a great way to pick up the feel of the place, and imagine you are a local Londoner going about your day. 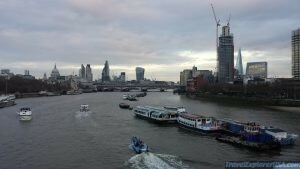 Another way to see an overview of London in a short time is a boat tour on the River Thames. See photos here. To experience a less hectic area of England, we recommend a visit to Yorkshire. We chose the area because we have wonderful family to visit there, but found nearly everyone there to be friendly. We stayed in Halifax in a wonderful downtown hotel. It was just down the street from an old church built in the 1300s. For an American, seeing a building that old still in existence and doing fine is just amazing. 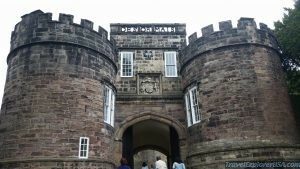 With just a relatively short road trip through some beautiful countryside, we were able to visit Skipton Castle. It was in a lovely little town where we were able to enjoy high tea. The castle itself held so much history. It was the first Norman castle in the area. Although the castle was not furnished, we freely walked around to all the rooms. There were signs explaining what each room would have looked like back in the day. And our daughter really enjoyed being able to run around in a castle with her second cousins. She enjoys telling people about high tea and playing in a castle in England. Of course, there are many sites to see in Yorkshire. For literary enthusiasts, Yorkshire is where you can visit the home of the Bronte sisters. Along the way you will see the moors of Jane Eyre and Wuthering Heights. Or, you can visit more castles. Bolton Abbey is a beautiful old church that is worth visiting as well. Be sure to try some Yorkshire pudding, which isn’t what Americans would consider pudding, but is very tasty.